On Monday, the Reds will visit Miller Park in Milwaukee for the first time this season. The Brewers (47-53) and Reds (55-45) have met only once this year and it occurred at GABP (May 17-18). 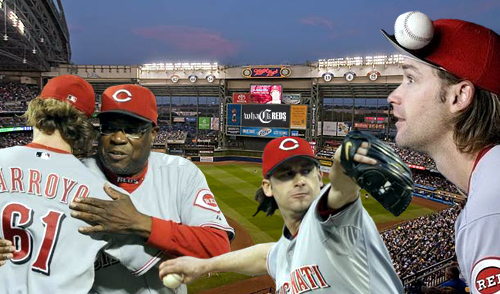 During a quick two-game series in which the Reds won both, Johnny Cueto and Homer Bailey combined for fourteen innings, allowed three earned runs on eleven hits, and struck out eleven. Since the All-Star break almost two weeks ago, the Reds have gone 6-4 against the Rockies, Nationals, and Astros and failed to lose a series. The Reds entered the break one game ahead of St. Louis in the NL Central. Despite a seven-game winning streak to begin the second-half, and winning eight of their last eleven games, the Cardinals remain only 1/2 a game ahead of the Reds going into Monday. The Brewers are coming off a three game sweep of the Washington Nationals and have gone 7-4 since the All-Star break, but allowed 38 runs during their four loses. In 2009, the Reds finished 8-7 against the Brewers and five of their eight victories were on the road. The Reds won their first series against Milwaukee at Miller Park (April 13-15) and split a two-game series (May 6-7) at GABP. The Reds were swept during three games in Milwaukee during May 29-31 and lost their fourth series against the Brew Crew in Cincinnati. The two teams split a four-game series (July 16-19) in Ohio before the Reds returned the previous sweep, winning three straight (the first two in extra innings), during August 25-27. Prior to July 25 last season, the two teams played all but one series against each other. After playing each other just twice this season, The Reds and Brewers will face-off twelve more times (7.26-28, 8.30-9.1, 9.20-22, and 10.1-3) before Cincinnati's regular-season ends on October 3rd. Bronson Arroyo (10-5, 4.26) will face Randy Wolf (7-9, 5.20) at 8:10pm on Monday. In sixteen career starts against the Reds, Wolf is 9-2 with a 4.73 earned run average. Wolf held Cincinnati hitters to a .225 average during 104.1 innings while striking out 114 and walking 21. Bronson Arroyo has started against the Brewers 17 times during his career and has lost to them six times while winning nine and posting a 3.80 ERA. He has held opposing Brewers to a .256 average, but allowed 17 homeruns during 109 innings pitched (one every 6.4 innings). Arroyo is 3-1 with a 2.63 ERA lifetime at Miller Park. On Tuesday, Edinson Volquez (1-1, 7.56) will make his third start of the season for the Reds against Yovani Gallardo (9-4, 2.45) at 8:10pm. Coming off a rough July 22 outing in which he allowed six earned runs in just 2.1 innings, Volquez will look to rebound against a Brewer ball club that has taken him deep five times in 22.2 innings during their brief history. Despite a 6.35 ERA and allowing 17 runs on 27 hits against the Brewers in four career starts, Volquez has a 2-1 record. Within the NL Central, only the Brewers (.290) and Pirates (.241) own career averages above .200 against Volquez. Yovani Gallardo has started six games against the Reds during his four-year career and also owns a 2-1 record against his division rival. Gallardo's ERA against Cincinnati is 3.50 and he has struck out thirty batters, while walking 22, in 36 innings of work. Game three will feature rookie left-hander Travis Wood (0-1, 2.76) against Chris Naverson (8-6, 5.93) at 2:10pm on Wednesday. Naverson has never started a game against the Reds, but in two career appearances totaling four innings Naverson allowed four hits and one run while striking out three. Travis Wood will be making his first career start against the Brewers and is still in search of his first major league victory.